A simple and quick way to increase your refrigerator cooling,plus the main feature of no Frost Build up. This unit will not take up space since it fits close the fins an the correct angle to circulate the coldness through out and to keep the un-wanted frost from building up across the evaporator fins. 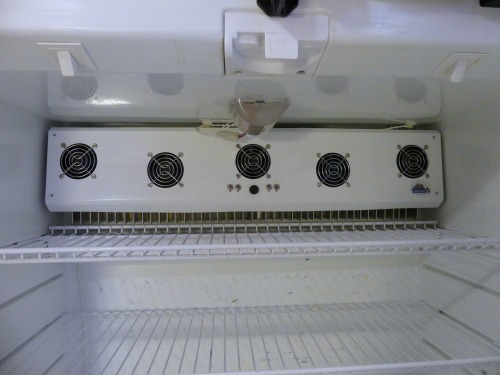 Make your refrigerator Frost Free and cold with our "Frost Guard" brand evaporator fan unit. Fans has a off-on switch for independent control of either 1, 2, 3, 4, or 5 fan plus LED light at any time. Fan wire Harness will come with termials you crimp on after you slide the fan lead through the drain for the DC connection. We will have picture and install details coming soon.